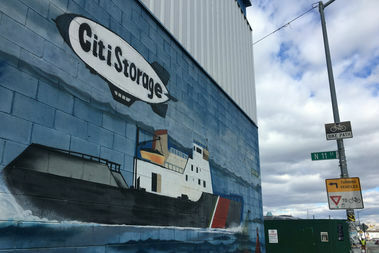 The city forked over $160 million to CitiStorage property owner Norman Brodsky on Wednesday. WILLIAMSBURG — The city closed a $160 million deal to buy the last piece of property it needed to complete the sprawling 27-acre waterfront Bushwick Inlet Park Wednesday, touting the deal as proof that the mayor's office would stick to its word. North Brooklyn was promised a 27-acre waterfront park during the Bloomberg-era 2005 rezoning which allowed for the explosion of luxury apartment towers along waterfront. While the condo towers arrived and continue to sprout up with full force, the progress at the park has dragged behind, and until Wednesday, the city was still missing a keystone 11-acre parcel of the future park, which now houses a CitiStorage building owned by Norman Brodsky. After months of backroom discussions, and pressure from community advocates and local politicians, the city finally reached a verbal agreement with Brodsky for $160 million in November, $60 million more than it had publicly offered in June. For his part, Brodsky had sunk far below the $325 million he'd asked for the land, he said. He said he had two potential buyers who were willing to pay around $170 million and who wanted to build commercial buildings as of right without rezoning the land, but he declined to comment on who they were. "I always wanted it to be a park," Brodsky said, reached on the phone Wednesday. "I had no problem with that as long as I get paid a fair amount of money — the value of the land." Brodsky said that the multimillion dollar deal would never have happened, if it weren't for the North Brooklyn residents who started pressuring the city to make good on the 2005 promise of a park, following a raging fire that burned for five days in February of 2015, destroying some warehouses on the property. "If it wasn't for community activists, I don't believe this would have ever been done. I think they struck a chord at the right time with de Blasio," Brodsky said. Beyond the $160 million, the city has already allotted $225 million towards the park which has gone towards building out the first section of the park, buying another piece, and remediation and demolition at that site, according to the Parks Department.